This week's post is subtitled "Audra, slow it down!" Within a couple of days of starting to sit, Audra even stopped using her arms for support and sat straight up on her own. 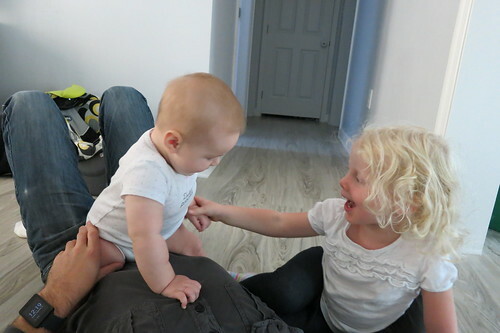 The problem with that is she then topples over, and our floor is not very forgiving :( Even when we try to catch her, she still slips by enough times that she has learned she definitely does not like conking her head on the floor, which invariably leads to full-on screaming now. And now she'll scream even when we catch her or she just falls over without hitting anything, since I guess just the sensation of falling reminds her how much she doesn't like it. 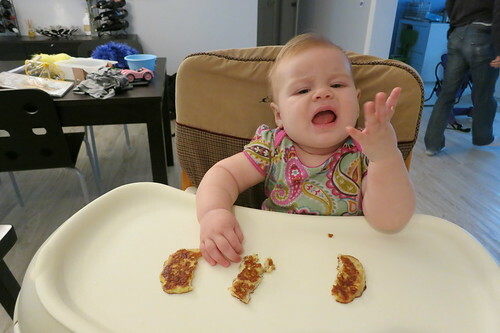 Audra is SO LOUD when she's upset (ok, when she's happy too! ), so this has been a very scream-y week for her, between the falling over and cutting teeth, Ryan went in to get her when she woke once last week when I was in the shower, and since she goes 0-60 very quickly, she was already worked up by time he got there... and he said when he opened the door, the volume and intensity of her screaming literally took his breath away. So yeah. That's fun. So yeah, apparently Audra's "down-dog" moves that so confounded me last week were actually just prep for her to start standing up, since instead of just doing down-dog off the floor, she started doing it with her hands on her bouncy chair, then graduated to pushing herself to standing using her bookshelf, stools, Ryan, play tables, etc. She even tried standing on her own, which didn't go so well - she stood straight up and then just continued on over, but at least she was on the bed when she tried that. And finally, Audra's bottom two teeth are coming through now. 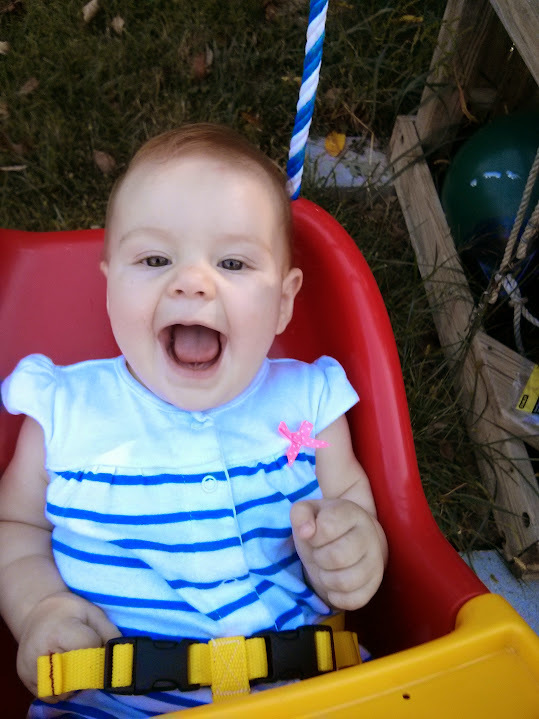 It seemed like she was a pretty stealthy teether at first, since there was no noticeable increase in her gnawing on anything, drooling, or fussiness, but the fussiness kicked in over the weekend as the teeth actually started coming through. She also got quite upset with me when I took a book away that she was in the process of mangling - not that I want her to be fussy, but this was still sort of exciting, since she's starting to make her preferences known for "wants" rather than just "needs". 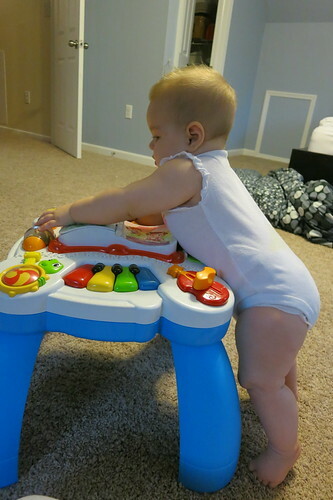 It seems she really is liking being able to get herself around now, and she's starting to explore her world more and more: she pushed herself to sitting the other day, crawled over to her bookshelf and then systematically cleared it out before using it to stand up. Given her lack of mobility even a few weeks ago, this is pretty amazing. 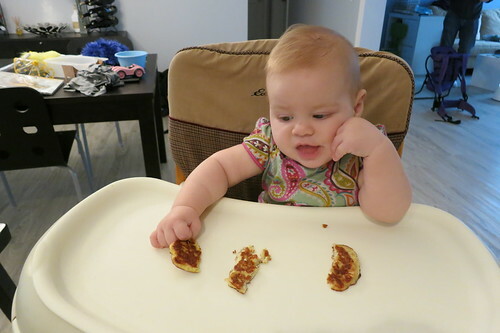 Audra has started having conversations with us, as she'll grunt to get the conversation started and then will continue to grunt in response to our grunts :) She also partook in what may possibly be a new weekend tradition of pancakes for breakfast, assuming I can keep this going. 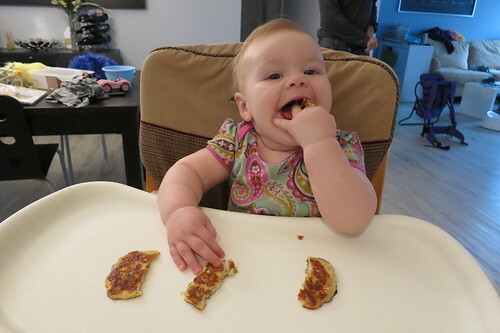 We're just having banana pancakes for now, until I can start having dairy again, but Audra (and Josie) seemed fine with them regardless :) She has gotten a lot better at actually getting food to her mouth, and seemed to especially like hummus and pita chips for this week.